It’s a fact that people love a poll. Whenever any radio station, newspaper or magazine provide a ‘list’ people can’t help but look regardless of how important or pointless they are. Publications like Smash Hits, Record Mirror and NME, among others, used to run a list of things like the top 10 favourite and least favourite DJ of which John Peel once topped both lists at the same time! 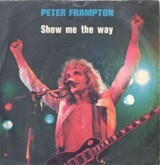 In the sixties teen magazine Rave ran a poll called The Face Of…(any given year) which was basically a prediction of who the reader thought was going to be the ‘next big thing’ the following year and in 1967 Peter Frampton topped the poll where he is still remembered today as The Face of 1968. Frampton was born in Bromley in 1950 and as a teenager attended Beckenham Technical School in Bromley, Kent where his father, Owen, was head of an extensive art department. He was an inspirational teacher who actively encouraged his son to become a rock star by giving him his first guitar lesson. Another pupil at that school at the same time was David Bowie and it was Owen who taught Bowie art. George Underwood was another attendee who later became a painter and designed three David Bowie album covers, Space Oddity, Hunky Dory and Ziggy Stardust. In 1962, at the age of 12, Peter and David joined different bands, Peter was part of the Little Ravens and David joined George and the Dragons. The pair regularly shared their love and interest in music at break and lunchtimes they would spend time together singing and playing Buddy Holly songs. Two years later Peter was a member of the Truebeats and then the more professional outfit The Preachers, the latter of which were managed and produced by Bill Wyman. At 16 he was invited to join The Herd as guitarist and lead singer and they scored three hits; From the Underworld, Paradise Lost and their final and biggest hit I Don’t Want Our Loving to Die in April 1968. At the age of 18 and now a something of a veteran, Frampton joined singer Steve Marriott of The Small Faces to form the supergroup Humble Pie. It was in that band that he established himself as one of the great guitarists of his generation, most notably on the 1971 live double-album Performance Rockin’ the Fillmore, which includes a 23-minute version of Dr. John’s opus I Walk on Gilded Splinters. They only managed one UK hit single, Natural Born Bugie which reached number four and then Peter left for a solo career. His debut solo album, Wind of Change was well received although it didn’t make the UK chart, having Billy Preston and Ringo Starr helping out would certainly have boosted its credibility. He released three further albums, Frampton’s Camel in 1973, Somethin’s Happening in 1974 and Frampton in 1976 all commercially unsuccessful, but everything changed later that year when he presented the world with Frampton Comes Alive! It was a double album featuring 14 tracks recorded at the Marin County Civic Center in California, the Winterland Ballroom in San Francisco, Long Island Arena, New York and SUNY Plattsburgh in New York and all recorded between June and November 1975. It wasn’t a new invention. It has been around a long time and the earliest known variation of it dates back to 1939, when pioneering pedal steel player Alvino Rey attached a specially-wired microphone, designed to modulate his instrument’s sound, to his wife’s throat. In performance, his wife hid behind a curtain and ‘mouthed’ Rey’s guitar lines, creating what was called a ‘singing guitar.’ Surprisingly few musicians use it, the only other commercial use heard on these shores was by former-Eagle, Joe Walsh, on his 1977 hit Rocky Mountain Way, although The Who did use it to ‘speak’ the days of the week on The Who’s 1967 album, The Who Sell Out. Show Me the Way was one of the first songs U2 performed at their high school talent show back in the days when they were still called Feedback and it clearly hasn’t done them any harm! The Frampton Comes Alive! album has sold over 11 million copies worldwide and is the best-selling live album of all time. In 1987 he lent his services to David Bowie again for his top 10 album Never Let Me Down and appeared with him on the Glass Spider tour. In 2007 he released an instrumental album called Fingerprints which earned him a Grammy Award for Best Pop Instrumental Album and in 2014 he was the featured lead guitarist in the house band for the all-star concert The Night That Changed America: A Grammy Salute to The Beatles.